Spanish Mastiffs: Spanish Mastiffs are stocky, robust, rustic-looking dogs. Very large and rather lengthy with massive chests and the power of heavyweight contenders, Spanish Mastiffs are well muscled and with strong bones. They have massive, well-proportioned heads with deep muzzles, strong jaws, full lips and a characteristic dewlap on their necks, showing clearly their mastiff type. Spanish Mastiffs have double dewclaws on their hind feet, a characteristic this breed shares with such breeds as the Great Pyrenees. Their coats can be short or long with a dense under-layer and an almost wooly texture. Their skin isabundant and loose on their bodies. Colors include plain yellow, red, black, wolf-grey, and red-brown, or spotted. The center of their backs and their tails have longer hair. Their eyes are small, commonly sporting a relaxed, carefree expression. Their ears are pointed and their tails are fringed and carried low. Although a very heavy breed, its movement should be free and flexible. There are two types of Spanish Mastiffs: a bigger, heavier mountain type known as the Mastin Pesado (Heavy Mastiff) and a lighter, more refined type called Mastin Ligero (Light Mastiff). The heavier mountain type are impressive to look at and is most populous in the mountains in the North of Spain. This type has more head, more bone mass, more loose skin, is more "Mastiffy", has more dewlap and can weigh well over 200 lbs. While lighter Mastiff type is faster, more agile and athletic and is more common in the Meseta and in Andalucia (in the south of Spain). However, these two types are not regarded as breeds of their own, but rather they are regional variants (the heavy type from the north and the light type from the south and central parts of the country) of the same breed and the two types often interbreed. In character and function, Spanish Mastiffs are classic Livestock Guardian Dogs and are very similar in many ways to their cousins, Anatolian Shepherd Dogs. 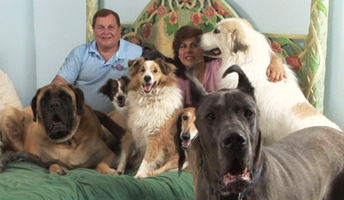 Spanish Mastiffs can be quite independent by nature, and are dignified and noble. Spanish Mastiffs are loyal and will sacrifice their lives to protect you, your family when necessary. They want to be close to you at all times and follow you everywhere. Unwelcome guests will have absolutely no chance of stepping onto your property. They will often choose the highest spot they can find (such as a small hill, etc.) on your property, from which to survey their domain for potential danger. Spanish Mastiffs can be surprisingly quick and agile in spite of their massive size and bulk. Spanish Mastiffs are very intelligent and are capable of making their own decisions and solving problems on their own. In Spain, shepherds often put traditional carlancas (spiked collars) on their Spanish Mastiffs to protect their necks in case they get into fights with wolves while defending their flocks/herds. They were never used to herd livestock, only to guard them. They have also been used as draft dogs; pulling heavy carts over difficult terrain and with excellent results for guarding property, such as Spanish vineyards, fruit orchards, homes, large estates and in the past during Spanish civil war, for guarding munitions. 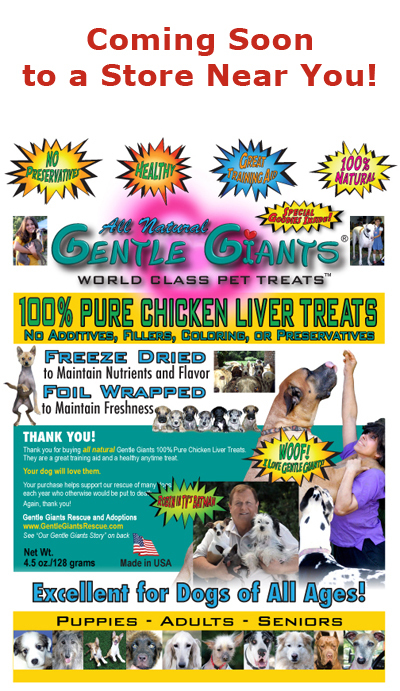 They are relatively calm dogs when adults, but as with all giant breeds they can be very energetic and bouncy when young, but once mature they are quite low-keyed and calm dogs. Spanish Mastiffs are very slow to mature, especially the males which do not reach adulthood until 4 years of age. They are generally very tolerant of and patient with children, pets and all other family members, but must be carefully introduced to new comers. Being so big and strong they can unintentionally hurt a young child, especially young Spanish Mastiffs who have a tendency to play rough. Some of the larger males can weigh as much as 265 pounds. Spanish Mastiffs are the largest of all the Spanish native dog breeds and is the heaviest of the Livestock Guardian Dogs. Spanish Mastiffs are native to the region of Estremadura in Spain. They are believed to originate from the ancient Molosser dog, that can be traced back to 2000 years B.C. These dogs were probably introduced to the Iberian Peninsula by Phoenician tradesmen who had brought them from Syria or India. Mastiffs have been known to exist in Iberian for thousands of years, however, no Standard for the breed was drawn up until 1946. Spanish Mastiffs are popular in Spain as a guard of both livestock and the home. Spanish Mastiffs are the national dog breed of Spain and are now the most numerous of all the native Spanish dog breeds in that country. The province of Leon in north-western Spain has the largest Spanish Mastiff population in the country, particularly in the mountains. Leon is now known as the Spanish Mastiff capital. Even though Spanish Mastiffs are a very rare breed in other countries, this is a very popular dog in their native Spain. In fact, the breed is almost as common there as the Labrador Retriever is in North America. The Spanish Mastiff has been as designated as the national dog breed of Spain. MEET AND ADOPT A BEAUTIFUL SPANISH MASTIFF! 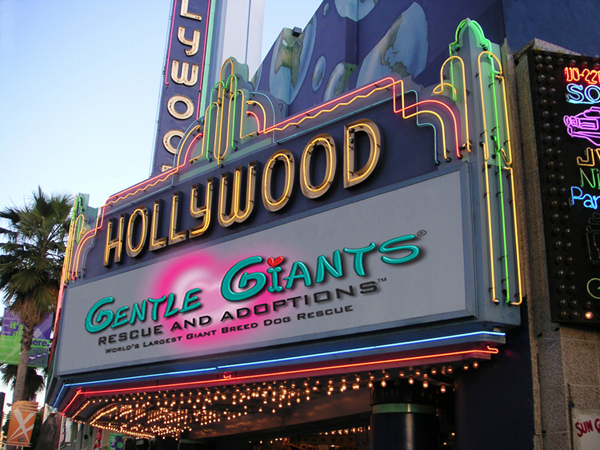 Please Note: Gentle Giants Rescue - Spanish Mastiffs reserves the right to make changes, additions, deletions and/or modifications to its website, documentation, requirements and policies at any time. All such changes, additions, deletions and/or modifications to its website, documentation, requirements and policies may apply retroactively at the discretion of the company. 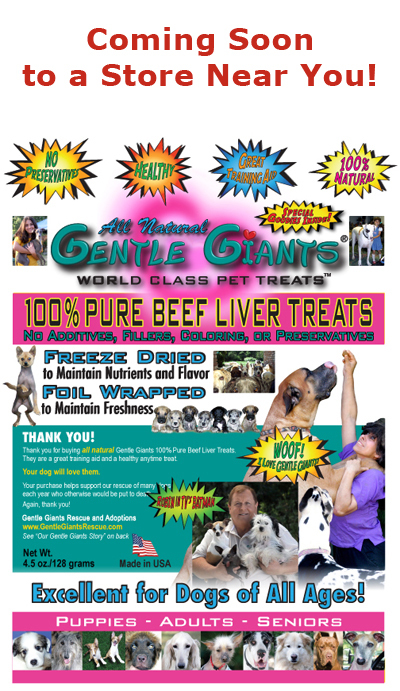 © Copyright 2003-2011 Gentle Giants Rescue - Spanish Mastiffs. All Rights Reserved.